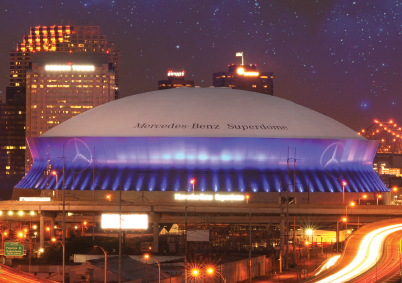 While there may not be 76,468 people attending the Jewish Federation of Greater New Orleans’ Annual Celebration this year, it will still be a Superdome-sized event. The Oct. 10 celebration will be held on the field of the Mercedes-Benz Superdome, starting at 6:30 p.m. The entire community is invited to a celebration of where sports intersect with Judaism and Israel. The event will feature a panel of notable athletes, who will be announced shortly. The event will be kosher-style, with a buffet offering salmon and vegetarian options, and kosher meals upon request. Reservations can be made at the Federation website, jewishnola.com. Regular tickets are $100, with Angel tickets at $250. Young adult tickets, to age 45, are $50. On Oct. 4 at 6:30 p.m., there will be an Angel Appreciation Party, where Angels and sponsors for the annual event will be honored. The sports-themed cocktail party will feature local sports celebrities. Based on community feedback, the annual celebration and the business meeting are being separated. The Federation’s annual meeting will be on Oct. 30 at 6 p.m., at the Uptown Jewish Community Center. The meeting will celebrate the 2018 Annual Campaign, honoring co-chairs Julie Schwartz and David Radlauer. The Federation announced that the 2018 campaign raised $2,703,281, an increase of over $100,000 from the 2017 campaign. Bradley Bain will be presented the 2018 Herbert and Margot Garon Young Leadership Award. As part of the award, he will attend the 2018 Jewish Federations of North America General Assembly, which will be held this October in Israel.